Barcode and RFID are two different forms of technology which are used for collecting and reading data. While both are commonly used for asset and inventory tracking, their capabilities and how they work differ significantly, where each has its own benefits and disadvantages. Most businesses are familiar with the barcode inventory system as a means of managing and tracking stock. A barcode is a visual representation of data which is represented by a sequence of lines that requires the use of an optical scanner to decode the barcode’s information. 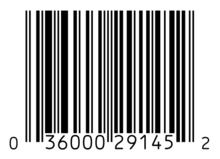 Typically barcodes contain data regarding the manufacturer, the product, and the price of the associated item. While barcode accuracy has been said to be the same or even better than RFID tags, scanners must have a completely unobstructed view of the barcode in order to scan successfully. 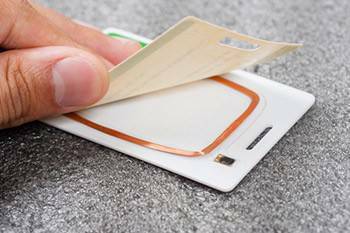 RFID (radio-frequency identification) uses radio waves to transmit information from RFID tags to an RFID reader. Each RFID tag contains a microchip which holds information about the item to which it is associated. The most widely used tags are called passive ultra-high frequency (UHF) tags, which typically only contain a basic identification number. Other RFID tags are capable of holding up to 8 KB of data, anything from price, colour, manufacturing date, shipping date, maintenance history, and more. Each tag includes a radio antenna that allows it to receive signals from a reader. Unlike barcodes, RFID readers do not need line of sight visibility and can simultaneously scan more than 100 tags at a time. RFID tracking software tags are made active by radio signals from the reader, meaning potentially hundreds of tags may be read per second. On the contrary, barcodes are very labour intensive as each barcode must be scanned individually. In addition, RFID tags can be read from as far as 15 meters away, and aren’t plagued with some of the common problems which affect barcodes. When labels are dirty, torn or obstructed, the readability of barcodes can be affected, especially as they are typically printed on paper and plastic- both of which can be easily damaged. While RFID tags are generally more durable and are available in many different forms, from paper labels to hard plastics, RFID readers struggle picking up information when passing through metal or liquid. These elements can interfere with radio signals, making it difficult or impossible for the reader to accurately interact with tags. While efficiency and effectiveness should come into play, cost can also be a major factor when considering a tracking system for your assets and inventory. Barcodes are directly printed onto plastic or paper materials where the only cost involved is the ink. On the other hand, RFID tags are generally more expensive where a single tag can cost upwards of $30. RFID readers are also about ten times more expensive than barcode scanners. 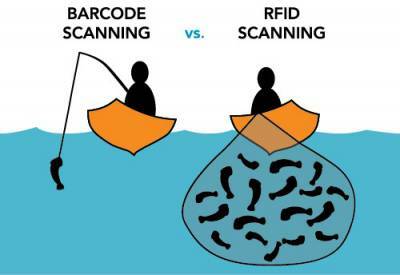 Barcodes and RFID are different in many ways, where one is not necessarily better than the other. While RFID is a powerful technology, the complexity and expense is not feasible for all businesses. Ideally, a company should evaluate its inventory or fixed asset tracking needs, choosing a technology which is right for them.